This is a really lovely trend — who doesn’t love flower prints and on a large scale? Look out for big blousy designs that have a pre-Raphaelite style and you’ll find them on cushions, bedding and as murals (shown here). Keep the rest of the look simple, so the florals become the star and pick out key colours to accessorise with. This is a combination of different elements that creates a beautiful and simple look with the emphasis on natural-looking furniture. 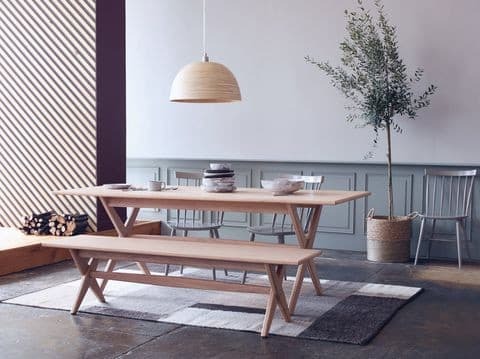 As Kate Butler, head of design at Habitat, explains: ‘Here there’s been a focus on stripped timbers, wood grain and a return to simple, natural patinas and materials within furniture.’ Team this with gently patterned crockery, soft grey chairs and a neutral block coloured textured rug to complete this calming trend. Although we had gold as a trend back in spring/summer, it’s still very much here and you’re going to see even more of it this season! So how about using it in a different form instead of as an accessory? Yes, that’s right — GOLD carpet, and isn’t it fabulous, especially with this Mid-Century modern furniture? Fans of monochrome will adore this trend. It’s all about the accessories — and they need to be black. But if you’re not a massive fan of large amounts of black you can make this trend work by using small blocks here and there. Like this beautiful beaded pendant, console and shelving unit. Combine this look with tactile pieces and white to balance it out. Kitchens are undergoing a change, no longer are they simply all about one style of units, a worktop and a complementary splashback. This new and exciting trend is all about mixing it up — different textures sat next to each other, contrasting in both colour and touch. ‘A sleek quartz work surface with an integrated solid wood chopping board or dark cabinetry against a clean marbled splashback, makes for an eye-catching space, and one that is full of character,’ says Daniela Condo, designer at Life Kitchens. Navy is the BIG colour for these coming seasons, gentle on the eye yet moody enough to be perfect for the winter months — you’re going to see it everywhere. Here, it’s been teamed with gold and this wallpaper is inspired by sashiko, a form of functional embroidery from Japan that uses geometric stitching to mend areas of worn clothes. Keep accessories simple and let this dazzling wallpaper be the focal point of your room.